One of Eric Rohmer’s earliest films, La Collectionneuse, is in essence about three “collectors” idling away the summer in the south of France, namely, an off-handedly attractive young woman who appears to take on a new sexual conquest nightly and a pair of male guests who have been invited to stay at the same 17th-century villa where she visits. One of them is an art dealer and the other, a painter, but both, we could say, are collectors of ideas and philosophies. Strangely, all three characters come to mind, along with their sensual outings in the divinely pristine landscape never violated by Rohmer’s naturalistic lens, as we follow the emerging relationship between Séraphine Louis (Yolande Moreau) and Wilhelm Uhde (Ulrich Tukor) in this season’s award-winning eye-opener, Séraphine, a highlight of the 13th “City of Lights, City of Angels” week of French film premieres in Hollywood, April 20th-26th at the Directors Guild of America. Here it’s useful to back up. Séraphine de Senlis, as she came to be known (after the town where she lived) was a shepherdess as a child and then, as a teenager, worked as a maid in an institute for young women where she was able to observe the drawing teacher’s classes. At age eighteen she became a servant for the nuns at Saint-Joseph-de-Cluny Convent where she worked for the next two decades. When in the early years of the 20th century she left and was working again as a maid at middle age, one of her guardian angels pointed her down the path of painting, according to Séraphine, who never ceased to respond to these visions and voices that guided her. By 1912 she was doing an hour of housework each morning for a petit bourgeois family in Senlis. This allowed her to dwell in her own meager attic room and, more significantly, to venture into the woods nearby. There she collected soil and plants that she used (along with paraffin from vigil candles she pilfered from the cathedral and blood from animal organs simmering on the château stove) to mix her own pigments with a mortar and pestle. She applied them to wood with her fingertips. The result was something magical. 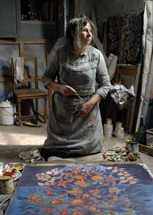 It’s important to note that in the film her modest life as an artist is as meted out as her humble routine as a cleaner. Church bells and the chimes of clocks mark the hours in this quiet gothic town, the grays of the walls and cobblestones accentuated only by the blues of Séraphine’s dress and shawl, of the clouds and the river, and the greens of the foliage that engulfs her on her daily walks. These walks commence at dawn or earlier, Séraphine with her basket or wheelbarrow, off through the meadows or marshes. Most everything begins and ends in the dark for her, except the paint she applies, crouched on the floor in the quiet of candle light in the middle of the night, unless she breaks into song, generally a hymn or a chant. And then the film fades to black and a new day commences. All of this changes only somewhat when she meets Wilhelm Uhde and is assigned to clean the rooms he rents at the château of her employer in Senlis. 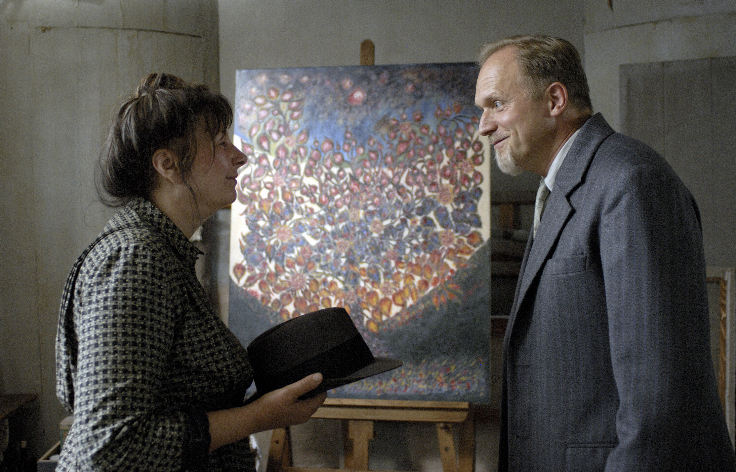 Séraphine finds a Picasso drawing of a lover’s embrace as she makes up Uhde’s bed. She admires his handwriting in his daily journal of life in the countryside, illustrated, no less. Stealing a look at his passages, she devours them word by word, as she does his note on the breakfast table, “Gone to Paris. Carry on as usual.” She gingerly stows it away. When she finds Uhde crashed on his bed in a mid-day drunken stupor, she tucks him in and empties his chamber pot. He wakes up to find a cooked meal she has left for him. And nothing is “as usual” any more. In the contrasting rich brown interiors of lamp-lit wood walls, the neighbors gather to honor and ogle Uhde, to wine and dine his fine taste as he coyly shrinks back from their ridicule of “lunatics who paint like six-year-olds.” Seduced by a discarded miniature of Séraphine’s apples painted on wood, he buys it from the hostess and bolts back to his room sans meringue flambé to enter a fascinating exchange of looks — between his eyes and the apples — lit by a single flame. A series of close-ups (a struck match, igniting a candle, lighting up the painting, reflected on his face) kindles the bond between subject and subject: painting and spectator, maker and consumer, artist and dealer, Séraphine and Uhde. “Do you have any others? You must give them to me immediately,” he gasps at her door. Of course he means paintings, and she retrieves them and he pays her. Yet it’s not easy to say whether the overwhelmed look on her face, once she’s alone, is for the coins she dropped in her box, the admiration of her art, or the flutter in her heart. Set aside Wilhelm Uhde’s lover, Helmut Kolle, who while he visits Uhde paints a portrait of Anne-Marie, Uhde’s sister, these two relations yet uncovered by Séraphine. It’s a suspenseful romance waiting to happen, in her eyes, and waiting to come crashing down, in ours. And we look for the obscured details foreshadowing its consequences, cinema being all about people looking at people looking. And, once again, the screen fades to black. 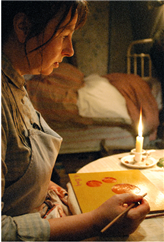 More rewarding are the counterpoint scenes, the rightful centerpieces of the film, with Séraphine painting in her prime. After all, Uhde has told her, “You can’t keep cleaning when you have gold in your hands.” But Séraphine mutters an adage from S. Teresa de Avila, “Be ardent in your work and you will find gold in your cooking pots.” Uhde sits her down on a heart-shaped chair and, stooping low like a lover to propose, promises to look after her. He hands her money and offers her more, which she refuses. And then he’s out the door to his homeland in 1914. Séraphine offers intimate portraits of this artist at work throughout the war, more prodigious than ever, her panels taking up the floor of her dwelling as she puts more paint on the wood than food in her stomach. When a local newspaper touts the success of her work on exhibit at the Senlis Town Hall, Uhde, settled into his estate at nearby Chantilly, tells Anne-Marie he’s convinced Séraphine is dead. But one look at her new art and Uhde soars up her staircase, grooming his hair before knocking as in years past, to salute her day in the sun by now providing her a monthly stipend and deliveries of canvas, brushes, and paints (the latter, requested or not). With sales and some critical acclaim, Séraphine moves to a new home, setting it up with all the finery she can buy, dreaming of her own show in Paris. She still paints as if possessed, but soon possesses more than she can claim. The year is 1929. What transpires at this point can be ascribed to any of many symptoms and causes: extreme religious mysticism, psychological delirium and delusions of grandeur, longstanding physical deprivation, anxiety over performance expectations and shattered dreams, abrupt economic disorientation, global crisis, and loss of faith and trust in a beloved. 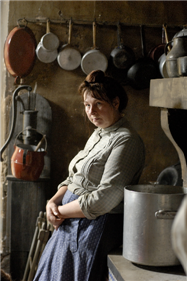 The film shows Uhde making Séraphine’s confined life thereafter as comfortable as possible. Among all the questions raised by the film — about sources of inspiration, the workings of the imagination, the means of creativity, the relation between the artist and the métier and money, the possibility of steadfast integrity, the resiliency of the spirit — at least some of these give rise to other questions, about what kind of film can address the work of such an artist, and how that film can be made. Dreyer, Bresson, and Vadim have all sought to present (if not to represent) Joan of Arc and her visions. Yet as for portraying artists, how to focus and to generate a dialogue among layers of meaning via the screen is a presiding question. Provost often places the artist, the method, the process, the result, and the reaction before our eyes all at once — in a single sequence and sometimes within a single frame, inviting a host of interpretations, visceral and theoretical alike. They give us pause to reflect on how we make meaning in our lives. Ironically, Provost’s simple static shots of Séraphine’s destitute circumstances but disciplined daily rituals betray a hidden world of immense autonomy and abundance. Séraphine won seven French Césars, including Best Film, Best Actress, Best Original Screenplay, Best Music, Best Cinematography, Best Set Design, and Best Costumes. In and of itself, it is an inspired and finely crafted work of art. Director: Martin Provost; Producers: Miléna Poylo and Gilles Sacuto; Screenplay: Martin Provost and Marc Abdelnour; Cinematography: Laurent Brunet (AFC); Sound: Philippe Van den Driessche; Editor: Ludo Troch; Original Score: Michael Galasso; Set Design: Thierry François; Costumes: Madeline Fontaine. Cast: Yolande Moreau, Ulrich Tukor, Anne Bennent, Geneviève Mnich, Nico Rogner, Adélaïde Leroux, Serge Larivière, Françoise Lebrun. Color, 35mm, 125 minutes. In French and German with English subtitles.